Where would you find the city's most in-demand beekeeper on a day he's not rescuing a swarm of wayward bees and fielding a million news media inquiries about the finer points of the urban apiary? This past Wednesday, like most Wednesdays, Andrew Cote, head of the New York City Beekeepers Association, was selling honey, a product of his beekeeping ways, at the Union Square greenmarket. The honey was made, as one sign on his stall read, on "rooftops, balconies and community gardens in Manhattan, Brooklyn & Queens." 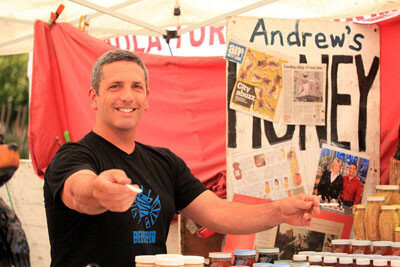 Yet Cote found himself fielding yet another media query about recent swarming events as he handed out samples of whipped honey to shoppers at the Union Square market, a symbol like no other of the local food movement. Asked why so many bees, he said an increase in the number of New Yorkers who kept them -- 250 he knows about, and likely more he doesn't know -- was partly attributable to a desire of people to be a part of that movement, to know the source of their food and not leave a big footprint in the environment while getting it to the table. But making their own honey is not the only reason residents get into beekeeping. Some use it as an opportunity to get closer to nature or to pollinate a garden, he added. All this became more doable after the city lifted a prohibition on beekeeping in April 2010. Cote surmised that some of these novice beekeepers could be behind the highly publicized incidents of bee swarms on city streets that prompted stories on local blogs, television stations, newspapers and even NPR. Cote has become one of several go-to men in these situations, called to help rescue the bees and then providing context in interviews with journalists covering the events. He said he was at the scene of a bee swarm in a tree outside the Bulgari store on Fifth Avenue and East 57th Street on June 8, a swarm around a mailbox in Little Italy on May 31 and another swarm on a light post in Chinatown on June 13. The swarms set off the city's usual fascination with unexpected interactions with wildlife. Just recently, New Yorkers displayed this fascination in a Twitter sensation that grew around a snake missing from the Bronx Zoo, and they oohed over the oh-so-cute photos of a seal that found its way to a Hudson River beach in upper Manhattan. The examples from years past are numerous -- hawks on the Upper East Side and a coyote in Central Park. Cote explained the bee phenomenon in simple, real estate terms. Bees -- like New Yorkers -- outgrow their homes. Take a couple who has kids, who then grow up and have kids of their own. They would never all fit in the original apartment. Same thing happens to bees, except they need their keepers to provide the additional space. Poor ventilation in a hive also can cause swarming. If the keepers are inexperienced or not paying attention, some bees may look for a new place on their own. The ideal spot for bees, according to Cote, would be a rooftop location, a few stories up, with dappled sunlight, southeast exposure for maximum morning sun and a windbreak from the northeast to protect the bees from the winter cold. It sounds almost as impossible to find as that nice two-bedroom apartment in a good school district. The point is that urban beekeeping is not something to be done lightly. The beekeepers association's website carries a five-page "best management practices for safe urban beekeeping." Beekeepers are also required to register with the city's Department of Health and Mental Hygiene. Among the association's recommendations: read at least three beekeeping guides before starting, "make sure that neighbors are not working or relaxing outdoors" when opening hives, provide lots of fresh water to prevent bees from looking for it elsewhere and choose a queen bee with a gentle disposition. The association also provides beekeeping classes, which is where Vivian Wang, a lawyer for the Natural Resources Defense Council, found herself after she became interested in the subject while working on a case about a pesticide that was potentially harmful to the honeybee. "Once I started reading about their importance to our food system and the complex world inside the hive, I got hooked on these amazing little insects," Wang said. "Bees and other pollinators are in trouble -- their numbers have been declining because of habitat loss, pesticide use, disease, and other stressors." 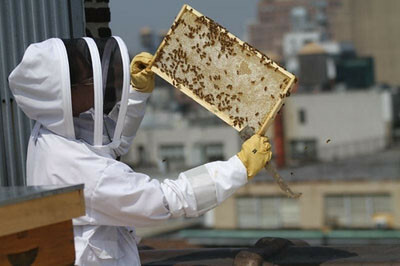 So about two years ago, she took the beekeeping class and set up three hives on the roof of the 12-story building in Chelsea that houses her office. The bees have a view of the Empire State Building. Wang -- who partners with Let It Bee Apiaries, with hives in Westchester County and the Upper West Side -- slips upstairs to care for the bees between meetings and conference calls. She said beekeeping provides a break from the city's frenetic pace. "The hive has an energy and order of its own, and the hum of the bees is a welcome contrast to the taxicabs' honking and subways' clanking," she said. When asked about all the news coverage of the swarms, Wang responded, "I think it's good for reporters to remind the public that while a buzzing clump of bees may look threatening, swarms are actually quite gentle because they have no hive to defend." Other beekeepers voiced similar sentiments. Paulo Anjoul, who learned beekeeping from his grandfather while growing up in Monkey's Eyebrow, KY, has three colonies on the Lower East Side. "The swarms happened so it is fair to report them, but to make it appear that they are a danger or menace is a problem," he said. "It is not realistic and fear-mongering in my opinion."